On the 7th of July players of Team Poland are going to the World Championships in lacrosse. The whole Polish lacrosse community awaits this moment with anticipation. It’ll be the first, historical appearance of the Polish National Team! Unfortunately Team Poland doesn’t have many sponsors who would decrease each player's costs. Lacrosse isn’t a qualified sport in Poland so we cannot count on help from the government. Polish players as well as their friends don’t give up. On the contrary, they’re doing everything to fundraise the necessary amount of money. 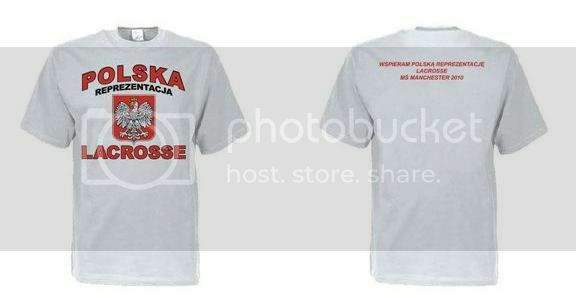 You can help us and become a part of Polish lacrosse history! You can buy one of the t-shirts from a limited series, price – only 35 zl. Money will be used to pay for the PNT transport to and from Manchester. PNT players from Poznań hit the streets to raise funds among citizens of Poznan. They offered souvenir photos with the PNT lax players. We would like to thank all of you who decided to support the development of Team Poland!